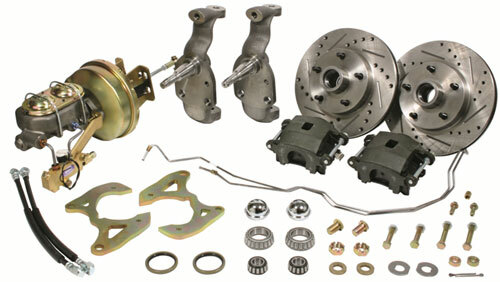 Lower your vehicle 2" and also improve the braking performance with our complete drop spindle disc brake kit. Wheels are moved out an 1-1/16 on each side. This kit works with most 14" wheels. Kit includes: 2" drop spindles, rotors, loaded calipers, bearings, seals, dust caps, spindle nuts, hoses, 7", 8" or 9" booster, master cylinder and pre-bent hard line kit, and proportioning valve. Note: Drop spindles lower the center of gravity while maintaining the full suspension travel. This will drastically improve the ride, braking, steering and handling. The slotted & drilled rotors shown are an extra cost upgrade.